It’s springtime, and that usually means a lot of dampness, heaviness, and cold. The best way to bring balance to your body is to deal with your digestion first by incorporating spices and lifestyle practices that will lift the heaviness and dry up the dampness. I love using herbs in cooking, it’s the quickest and most effective way to bring balance back to the body. Below are some of my favorite spices for balancing Kapha dosha during late winter and spring. Dry roast the spices before grinding for a rich, smoky taste. I thank my teacher and mentor Mary Thompson for providing this recipe to me so that I may share it with you. Lightly roast them on an iron pan and grind them before using them in your meals. I also recommend using your Neti pot this time of year, at least 1x/week as a preventative measure, and always use a good Nasya oil after Neti pot. I love the formula I created for nourishing the nervous system and the brain. It’s excellent for all three doshas, particularly Vata and Pitta Dosha. 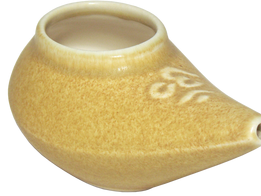 You can order my clay neti pot in a variety of colors for $20 and a 2 ounce bottle of my Custom Formulated Nasya Oil for $2, just send me an email to request your item. I look forward to hearing from you and how you enjoyed these spices!